Get the Funk Out! 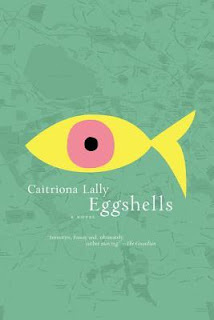 : Author Caitriona Lally joins Janeane 4/17 at 9:15am pst to talk about her novel "Eggshells." Author Caitriona Lally joins Janeane 4/17 at 9:15am pst to talk about her novel "Eggshells." If you missed Caitriona Lally on today's show, listen here! Caitriona Lally studied English Literature in Trinity College Dublin. She has had a colourful employment history, working as an abstract writer and a copywriter alongside working as a home helper in New York and an English teacher in Japan. She has traveled extensively around Europe, Asia, the Middle East, and South America. Caitriona was shortlisted for 'Newcomer of the Year' in the Irish Book Awards in 2015. Eggshells (Melville House; Hardcover; March 14, 2017), the exceptional debut from Irish writer Caitriona Lally, chronicles the life of idiosyncratic Vivian as she navigates Dublin in search of the place where she fits in. Delightfully inventive, alive with wordplay, and perfect for anyone who has ever felt they don’t belong, Eggshells is at once the whimsical story of a charming oddball, and a richly detailed travelogue of contemporary Dublin. Vivian has never felt like she fit in. As a child, she was so whimsical, so odd, that her parents told her she’d been “left by fairies.” Now, an adult living alone in Dublin, she has nosy neighbors, meddlesome social workers, a condescending older sister…and not a friend in the world. Until she decides it’s time to change her life. The first step is advertising for a friend, preferably one named Penelope. While she waits for someone to answer her ad, Vivian roams the city. With meticulous lists and hand-drawn maps, she sets out for a new neighborhood every day, searching for the portal, seeking her escape to a better world, the world her parents told her she came from. Lally’s acclaimed debut is perfect for anyone who loved Fredrick Backman’s A Man Called Ove or The Curious Case of the Dog in the Night-Time by Mark Haddon. Eggshells is a thoroughly modern take on classic Irish literature, full of wordplay, warm humor, and utterly charming characters. Told through hilarious, painfully awkward interactions, Lally offers readers a fresh, nuanced love story of friendship and human understanding.